Forests, tree and agroforestry systems have an important role to play in both emission reduction and the mitigation of climate change. They are key in the necessary adaptation of forests and people to examples of climate change that are already occurring, such as increasing temperatures, changing rainfall patterns and the increase of extreme weather events. Scientists work together across the whole of the CGIAR Research Program on Forests, Trees and Agroforestry (FTA) to develop effective, equitable and inclusive solutions to jointly address climate change and development outcomes that make the most of the potential of forests, trees and agroforestry. FTA’s partner institutions are participating in various ways throughout the 23rd Conference of the Parties (COP23) under the UN Framework Convention on Climate Change (UNFCCC), being held in Bonn, Germany. Below is an outline of the various FTA-related contributions at COP23. Nov. 9, 2017, 3pm-4.30pm, Meeting Room 9 REDD+ has seen ups and downs over the last years but is now firmly integrated in the Paris Agreement, and the Green Climate Fund is moving forward on REDD+ payments. What does it mean for the practice of REDD at national and subnational levels? Where are the gaps and what are the next steps needed to make REDD+ happen? For the full agenda, see the CIFOR side event page or the side event flyer. Organized by CIFOR and Indonesia’s Peatlands Restoration Agency (BRG) As part of the Nationally Determined Contributions (NDC), Indonesia is committed to reducing its national emissions as much as 29 percent (390 million tons) by 2030. Among the actions taken is to restore 2 million hectares of degraded peatlands. What does it take in terms of collective actions? Who participate? What is the progress? How can it be monitored and improved? This event will provide opportunities to negotiators and participants to learn ways and means to meet the targets. For the full summary, check the event page or the CIFOR@COP23 flyer. DIE interconnections zone CIFOR scientist Anne Larson will be among numerous speakers in this multistakeholder event. For more information, see the event flyer and CIFOR agenda. For more information, see CIFOR at COP23. Nordic Pavilion Bioversity International Director Ann Tutwiler will join several other food visionaries during this discussion on Nordic Food Day. Room 1 Ann Tutwiler is speaking at this event on Agriculture Action Day. For more information, see the Bioversity International website. Room 9 Organised by the IRD, INRA and CIRAD, in partnership with the Cornell Institute for Climate Smart Solutions and Global Research Alliance, this side event will be a chance for those involved (backers, decision-makers, civil society organizations and researchers) to share a common vision about the challenges of alleviating current uncertainties about carbon footprints and greenhouse gases, particularly in the agriculture and forestry sectors. This is part of the 4 per 1000 initiative, which aims to increase the organic matter in soils by 4 ‰ per year, in order to compensate for the planet’s greenhouse gas emissions and help ensure food safety. For more information, see the IRD press release. Fiji Pavilion, Bonn Zone With low-lying islands, fragile environments, and a propensity to natural disasters, small island developing states (SIDS) are among the most vulnerable countries to climate change impacts. According to the IPCC’s most recent assessment, rising sea levels and temperature increases are already affecting SIDS’ growth and development. For this reason, SIDS are among the most committed to combatting climate change. Currently reliant on expensive fossil fuel imports, Fiji along with other SIDS have recently committed to generating 100% of their electricity from renewable energy and sustainable biofuels by 2030. Bamboo could be a useful material to help Fiji and fellow SIDS along their way. This fast-growing grass plant is used across the world for typhoon-resilient construction, soil conservation and coastal protection, bioenergy and carbon sequestration. At this event, Fiji’s Minister for Women, Children and Poverty Alleviation, technical experts from INBAR Member SIDS and representatives from international organisations will share successful case studies of bamboo for climate change adaptation and mitigation in SIDS. This promises to give a fresh perspective on SIDS and use real examples of how this unusual grass plant can make a real difference. Bamboo is already a part of China’s carbon trading scheme, and bamboo charcoal is increasingly made in countries as far apart as Jamaica, Ethiopia and the Philippines. Madagascar is also piloting its first ever bamboo gasifier. In Latin America, meanwhile, bamboo housing is found to be more resilient to typhoons and other natural disasters. At this event, UNOSSC Director Jorge Chediek, INBAR Director General Hans Friederich, and other senior government and UN officials and representatives from international organisations will share very real examples of how bamboo is being used for climate change mitigation and adaptation across INBAR’s 43 Member states. INBAR and the UNOSSC will also launch a report, ‘Inspiring Sustainable Development with Bamboo’, which gives case studies of bamboo’s role in South-South Cooperation for poverty reduction, environmental protection, resilient house construction and renewable energy. The report is the latest in the UNOSSC’s South-South in Action series. Nov. 12, 2017, 9.30am-4.30pm This is a CGIAR-wide workshop to coordinate outputs and plan joint funding proposals, organized by the CGIAR Research Program on Climate Change, Agriculture and Food Security (CCAFS), CGIAR Research Program on Water, Land and Ecosystems (WLE) and FTA. For more information on CGIAR’s participation, see the CGIAR at COP23 page. Faced with the triple challenges of achieving food security, adapting to the impacts of climate change, and reducing emissions, agriculture has been prioritized by countries as a sector for climate action. 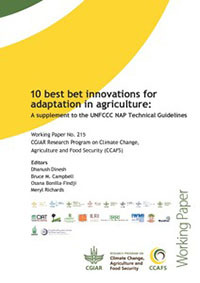 In order to support countries in the elaboration of their National Adaptation Plans, this paper aims to tap into agricultural research for development conducted by CGIAR Centers and research programs.